We closed on our beautiful 16 acres on September 13, 2016. While we were waiting for our closing date to approach we were trying to contact the people who owned the land directly in front of us - the land that our road easement cuts through. There is a specific spot that had been approved for an easement and we wanted to verify that these people were aware of it and there wasn't going to be any issues with them. Finally about a week before closing we got in touch with them We learned they are retirees who had been traveling for the summer - they hadn't been avoiding us after all as we had feared. After speaking with them we were relieved that they were fully aware of the easement and there wouldn't be any problems. They are in fact the ones who had granted this easement. We also learned a few more things about the history of the property. This sweet old farming couple had been the original owners of most of the surrounding land. Their family cemetery is right down the road. The house on the land directly in front of our is the home that this elderly gentleman grew up in. We love knowing this history! And the 16 acres that we were purchasing were sold off from his land along with a neighboring parcel to a developer in 2006. It was intended to be a small neighborhood. So about the time we were starting our search for our current home a developer was planning to build a neighborhood on our future property. But we all know what happened soon after 2006. The Great Recession strikes again! Later in 2006, the developer went bankrupt and needed to sell his just-purchased land. Our 16 acres went to the horse farm and the third parcel went to another neighbor for their horses. Our 16 acres are the two yellow rectangles on the right. 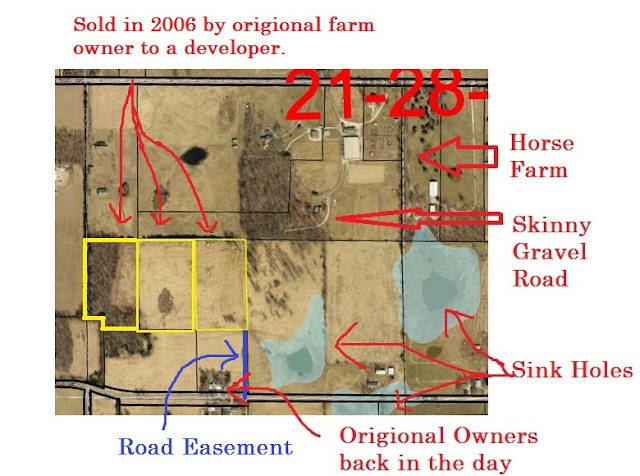 The Horse Farm owned our 16 acres for about 10 years until they owners of that property were ready to move on. After closing on our property we were finally able to set up a time to meet with the couple who lived directly in front of our land. At our first interaction with them we learned they were retired from farming and leasing out their land to other farmers, they had children, but neither of their daughters wanted to continue the family farming. Then they completely shocked us when they asked us if we wanted to purchase their remaining land! Whoa, wait a minute! We were hoping to eventually be able to pick up some more land in the future. We weren't 100 percent thrilled to be landlocked, but with the easement it was going to work out. But this was much sooner than expected. This is an additional 15 acres PLUS an old farm house! We had to think about this. We had just spent a bunch of our savings on the original 16 acres, could we swing this?! The answer wasn't hard to come to, this additional 15 acres was directly in front of our current property. It was clear this couple was going to sell this land and they were going to do it soon. If we wanted to protect our investment we needed to act. We didn't want someone else coming in and putting a bunch of houses (or whatever) in front of our land. Aaron went to this couples home and sat down with them at their kitchen table and came to an agreement on a price and a closing date. They had a contract ready to sign and so we did. We agreed on a closing date of December 28th, 2016. We also agreed that they could rent the home back from us for $1 a month, until the spring. They had lived in this home their entire lives and it was packed full of memories. They needed time to sort through things and search for a new home. We would take possession of the home on April 1st, 2017. So this is now what our property looks like. 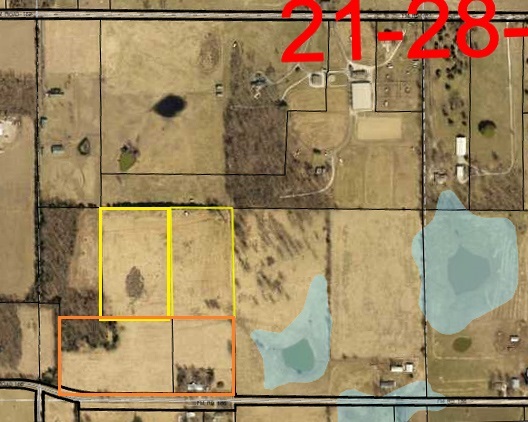 Orange highlighted area is the additional 15 acres purchased in December 2016. We are absolutely thrilled with how our property has come together. Even though there is a ton of land that this couple used to own that is now owned by others; putting our original 16 back with the 15 acres the farm house sits on, it feels full circle. With the addition of the front 15 acres, the road easement becomes a moot point. We can put our drive wherever we choose. We have decided that we will cut our road in on the left side of the property, through the wooded portion. It will set the tone for entering our property as we describe our style as rustic industrial. And what's to happen with the farm house, you ask? Well, that is a post (or several) of its own. To give you the cliff notes version, we are renting it out for the time being. I hope you've enjoyed this backstory, and that you'll follow along as we start our journey of building our dream home.